I’m a voracious note-taker. Sometimes people tease me about it in meetings or doctor appointments, but it has come in handy many times. I also like to record memories by taking plenty of pictures or video with my cell phone. I did none of that, though, during one of the very most significant events in my life: Mom’s memorial service this summer. Still, I remember vividly the fine details of the service and the moments at her graveside on that warm, July morning. The reception at our house afterward, however, is a bit of a blur. That’s because, thanks to Sylvia and several other dear friends who handled the business of the afternoon (food, furniture, flowers, clean up) my job was to just bump around the crowd in the back yard and try to connect in some way with the nearly 100 guests who came to honor the beautiful woman that was my Mother. One comment from the day continues to resonate with me. It was, in fact, the one statement during the service that prompted me to rummage through my purse for an ink pen so I could jot down the words. It still ricochets in my mind, still makes me proud of Mom, and still inspires me each day. Mom, the pastor said, Finished Well. Oh yes, she certainly did. Mom didn’t spend her final years, months, days feeling sorry for herself. In fact, she came to realize, very shortly after her 2011 diagnosis, that everyone has their painful or sad story; that story just may not be visible to the outside world. So she didn’t ask, “Why me?” She loved life and she wrung out of it every last smile, embrace, kiss and moment of connection that she could. Friends, family and even medical staff were drawn to her because she made people feel good. She connected with them, thanked them, praised them and appreciated them. As 2014 comes to a close, we are also entering the week that marks Zack’s 18th birthday and what would have been Mom’s 71st birthday. My thoughts naturally turn to what a tumultuous year it’s been. A brutal year of heartbreak and loss, bookended just this week with a reminder of the hope and excitement that lie ahead as we’ve learned that Zack was accepted to his first-choice college. So here’s my goal moving forward into the new year and into life. I want to honor Mom by doing exactly what she did. 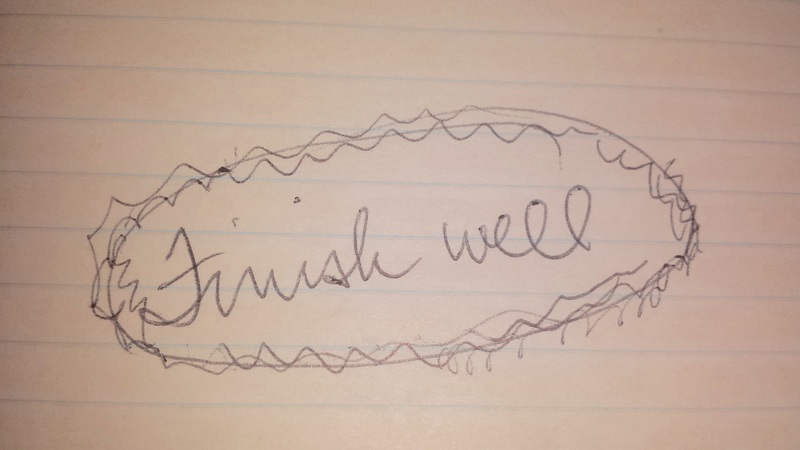 I want to finish well, in all that I do. Whether it’s a run (finish strong! ), reading a book (just finish it! ), a work project (make it quality! ), raising boys into young men (one moment at a time! ), or in marriage (embrace the future empty nest!). Whatever it is I’m doing, I will always remember Mom’s final tribute…and will do my best to honor her by finishing well.